Our translational research program focuses on a comparative approach, utilizing immunologically intact, canine patients with spontaneous cancer. This comparative approach provides a unique opportunity to evaluate the safety and effectiveness of next generation immunotherapies in a parallel canine patient population that presents the same challenges to effective immunotherapy as seen in human patients. The aim of this approach is to accelerate the translation of the most promising pre-clinical discoveries into the human clinic. Our lab is actively involved in developing the canine “model” for evaluating CART cell therapies. We have successfully translated several promising strategies to generate anti-tumor immunity from the lab and pre-clinical murine models into client owned dogs suffering from lymphoma, osteosarcoma and hemangiosarcoma. Our lab evaluates the immunological consequences of immune–based therapies in client owned dogs using flow cytometric phenotyping and functional assays including cytokine production, cytotoxicity assays and ELISpot assays to investigate canine T cell responses. 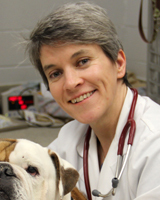 Dr. Mason leads a multi-institutional clinical trial evaluating the safety and efficacy of a recombinant Listeria to prevent metastatic disease in dogs with osteosarcoma. She also leads the coordinating center for Canine Cancer Immunotherapy Trials (U24) as part of the Cancer Moonshot program. The lab has extensive experience in methodology to robustly expand and genetically modify canine T cells ex vivo and is the first to perform clinical trials using CART cells in client owned dogs with treatment naïve or relapsed B-NHL. This single site trial is performed at the Veterinary Hospital of the University of Pennsylvania. Yin Yibo, Boesteanu Alina C, Binder Zev A, Xu Chong, Reid Reiss A, Rodriguez Jesse L, Cook Danielle R, Thokala Radhika, Blouch Kristin, McGettigan-Croce Bevin, Zhang Logan, Konradt Christoph, Cogdill Alexandria P, Panjwani M Kazim, Jiang Shuguang, Migliorini Denis, Dahmane Nadia, Posey Avery D, June Carl H, Mason Nicola J, Lin Zhiguo, O'Rourke Donald M, Johnson Laura A Checkpoint Blockade Reverses Anergy in IL-13Ra2 Humanized scFv-Based CAR T Cells to Treat Murine and Canine Gliomas. Molecular Therapy Oncolytics 11: 20-38, 2018. Garden O A, Volk S W, Mason N J, Perry J A Companion animals in comparative oncology: One Medicine in action. Veterinary Journal (London, England : 1997) 240: 6-13, 2018. Jackson Martina, Serada Nicole, Sheehan Maura, Srinivasan Satish, Mason Nicola, Guha Manti, Avadhani Narayan Mitochondrial genome and functional defects in osteosarcoma are associated with their aggressive phenotype. PLoS One 13: e0209489, 2018. Wang Guannan, Wu Ming, Maloneyhuss Martha A, Wojcik John, Durham Amy C, Mason Nicola J, Roth David B Actionable mutations in canine hemangiosarcoma. PloS One 12: e0188667, 2017. Panjwani M Kazim, Smith Jenessa B, Schutsky Keith, Gnanandarajah Josephine, O'Connor Colleen M, Powell Daniel J, Mason Nicola J Feasibility and Safety of RNA-transfected CD20-specific Chimeric Antigen Receptor T Cells in Dogs with Spontaneous B Cell Lymphoma. Molecular Therapy : The Journal of the American Society of Gene Therapy 24: 1602-14, 2016. Mason Nicola J, Gnanandarajah Josephine S, Engiles Julie B, Gray Falon, Laughlin Danielle, Gaurnier-Hausser Anita, Wallecha Anu, Huebner Margie, Paterson Yvonne Immunotherapy with a HER2-Targeting Listeria Induces HER2-Specific Immunity and Demonstrates Potential Therapeutic Effects in a Phase I Trial in Canine Osteosarcoma. Clinical Cancer Research : an Official Journal of the American Association for Cancer Research 22: 4380-90, 2016. Stroud Cheryl, Dmitriev Igor, Kashentseva Elena, Bryan Jeffrey N, Curiel David T, Rindt Hans, Reinero Carol, Henry Carolyn J, Bergman Philip J, Mason Nicola J, Gnanandarajah Josephine S, Engiles Julie B, Gray Falon, Laughlin Danielle, Gaurnier-Hausser Anita, Wallecha Anu, Huebner Margie, Paterson Yvonne, O'Connor Daniel, Treml Laura S, Stannard James P, Cook James L, Jacobs Marc, Wyckoff Gerald J, Likins Lee, Sabbagh Ubadah, Skaff Andrew, Guloy Amado S, Hays Harlen D, LeBlanc Amy K, Coates Joan R, Katz Martin L, Lyons Leslie A, Johnson Gayle C, Johnson Gary S, O'Brien Dennis P, Duan Dongsheng, Calvet James P, Gandolfi Barbara, Baron David A, Weiss Mark L, Webster Debra A, Karanu Francis N, Robb Edward J, Harman Robert J A One Health overview, facilitating advances in comparative medicine and translational research. Clinical and Translational Medicine 5: 26, 2016. LeBlanc Amy K, Breen Matthew, Choyke Peter, Dewhirst Mark, Fan Timothy M, Gustafson Daniel L, Helman Lee J, Kastan Michael B, Knapp Deborah W, Levin Wendy J, London Cheryl, Mason Nicola, Mazcko Christina, Olson Patricia N, Page Rodney, Teicher Beverly A, Thamm Douglas H, Trent Jeffrey M, Vail David M, Khanna Chand Perspectives from man's best friend: National Academy of Medicine's Workshop on Comparative Oncology. Science Translational Medicine 8: 324ps5, 2016. Ito Daisuke, Childress Michael, Mason Nicola, Winter Amber, O'Brien Timothy, Henson Michael, Borgatti Antonella, Lewellen Mitzi, Krick Erika, Stewart Jane, Lahrman Sarah, Rajwa Bartek, Scott Milcah C, Seelig Davis, Koopmeiners Joseph, Ruetz Stephan, Modiano Jaime A double blinded, placebo-controlled pilot study to examine reduction of CD34 /CD117 /CD133 lymphoma progenitor cells and duration of remission induced by neoadjuvant valspodar in dogs with large B-cell lymphoma. F1000Research 4: 42, 2015. Gaurnier-Hausser Anita, Mason Nicola J Assessment of canonical NF-?B activity in canine diffuse large B-cell lymphoma. Methods in Molecular Biology (Clifton, N.J.) 1280: 469-504, 2015.